Cyrious has added a Shipment Explorer, which will allow users to search for shipments more easily, and without having to go into individual orders. Here is an explanation of the fields on the Shipment Explorer. More information about the Shipment Explorer Instruments can be found how-to_use_the_shipment_explorer_instruments. Shipment No. - Users can enter the full shipment number, such as 1234-SAB, or perform a wild card search in this field, such as *SAB. Order No. - Enter the Order number to pull up all shipments associated with this Order. This can also be changed to look up by Estimate number or Service Ticket number. Tracking No. - Tracking number of the shipment; this field can also be used with a wild card search. Shipped Date - Search for shipments sent on a particular date or in a date range. This can also be set to All, which is the default. Shipped Due Date - Search for shipments with a particular due date or in a date range. This can also be set to All, which is the default. Type: Orders, Estimates, All - This filter can be used to show all Orders shipments, all Estimates shipments, or all shipments. Status: Shipped, Not Shipped, All - This filter can be used to show all Shipped shipments, all Not Shipped shipments, or all shipments. 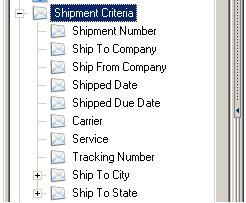 Salesperson - Select a Salesperson to see all shipments associated with their Orders and/or Estimates. Ship To City - Enter the city a shipment was sent to. Ship To State - Enter the state a shipment was sent to. Ship To Company - Enter the name of the Company a shipment was sent to. Ship From Company - Enter the name of the Company a shipment was sent from. Clicking the Advanced button will bring you to an advanced explorer, where you can use additional criteria to search for shipments.